The Quit India Movement (QIM) was first launched in August of 1942. It was a civil disobedience movement that was launched in response to Mohandas Gandhi’s call for independence. The call for Indian independence was in response to the British’s colonial power and the dissatisfaction in India over the colony situation. It emerged in part due to disaccord in regards to the positions of Britain and India on action to be taken in World War Two. The movement for independence was intended to be non-violent. The approach of non-violence stemmed from Gandhi’s opposition to violence of all kinds. The leaders of India and the Quit India Movement hoped to negotiate with Britain; these hopes were quashed when the leaders of the movement were jailed by the British. Despite the setback created by the incarceration of the leaders of QIM on July 14 of 1942 the Indian Congress passed legislation calling for complete independence for India. 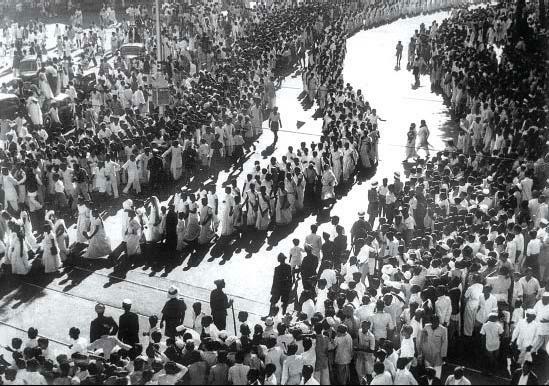 The Quit India Movement found a great amount of support as the masses acted together in the hopes of gaining an independent nation. The Quit India Movement was well received by the people of India but the response was much different back in Britain. At the time of this uprising Britain faced the problems of World War Two and was not willingly to expend time in negotiation; instead, Britain attempted to suppress the movement. The British issued mass detentions for supporters and leaders alike; even Gandhi was imprisoned. There are also reports of violent repression by the British with actions against the Indian masses including beatings and shootings. The British government at one time considered moving all of the leaders out of India but refrained in fear of a greater and stronger revolt. By the early parts of 1944 most QIM leaders were still jailed and the movement was grinding to a halt. By the end of 1944 QIM was considered to be over by most authorities. In 1946 all political prisoners were released. The British had appeared to subdue the calls of Indian independence but in the wake of the suffering of World War Two it was becoming harder for Britain to justify its retention of India as a colony. The Quit India Movement can be regarded as both a failure and a success. When the movement first ended the Indian Congress of the time viewed the action as a failure; however, the movement did create enough turmoil for Britain to come to recognize and classify India as a hostile and occupied county instead of a colony. They also achieved some regional success in India particularly in Sataraa, Talcher, and Midnapore. In these regions parallel governments were established alongside the British government. The Quit India Movement also reinforced nationalist sentiment and opened discussions for a transfer of power from Britain to India. On August 15 of 1947 the desire for independence was realized with the occurrence of the transfer of power. The Quit India Movement helped to sustain a desire for democracy and led to the establishment of some institutions.